‘Ulalena shares the rich history of Hawaii through a powerful journey and a true sense of Aloha. ‘Ulalena is a family-friendly theatrical performance at The Maui Theater in Lahaina. ‘Ulalena shares the rich history of Hawaii through a powerful journey and a true sense of Aloha. Kids and adults are going to be immersed in Hawaii’s history, culture, nature, and mythology. Played live with over 100 instruments, incredible visual effects, spectacular performances, and original music and dances, ‘Ulalena is an unforgettable performance that will leave guests a deeper understanding of Maui. Maui offers an extensive selection of snorkeling beaches for the family to explore. Snorkeling in Maui is a fun way to dip into the ocean with your kids and let them get comfortable in the water. Kids who are snorkeling beginners will enjoy the new world of texture, motion, and color of the ocean. Maui offers incredible snorkeling beaches like Honolua Bay which is overflowing with coral reef formations, schools of tropical fish, and Green Hawaiian Sea Turtles. For younger kids under the age of six, the Baby Beach in Lahaina is one of the safest locations for kids to introduce snorkeling gear and the ocean to. 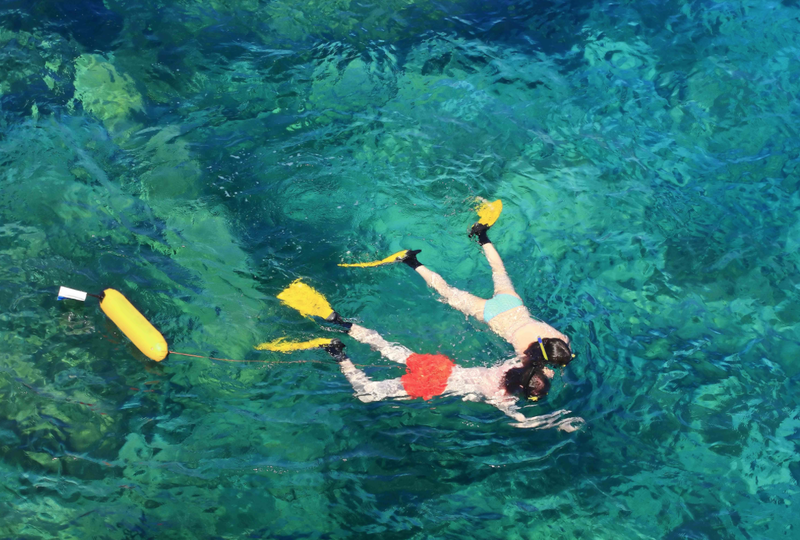 No matter what Maui snorkeling experience you or your kids are looking for, Maui offers an extensive selection of snorkeling beaches for the family to explore. Most Maui whale watching tours are accompanied by experienced marine biologists that would love to share their experience with these marine mammals. Maui whale watching is a sure way to ignite your kid’s inner marine biologist and astound him or her with one of the largest mammals on earth. Most Maui whale watching tours are accompanied by experienced marine biologists that would love to share their experience with these marine mammals. 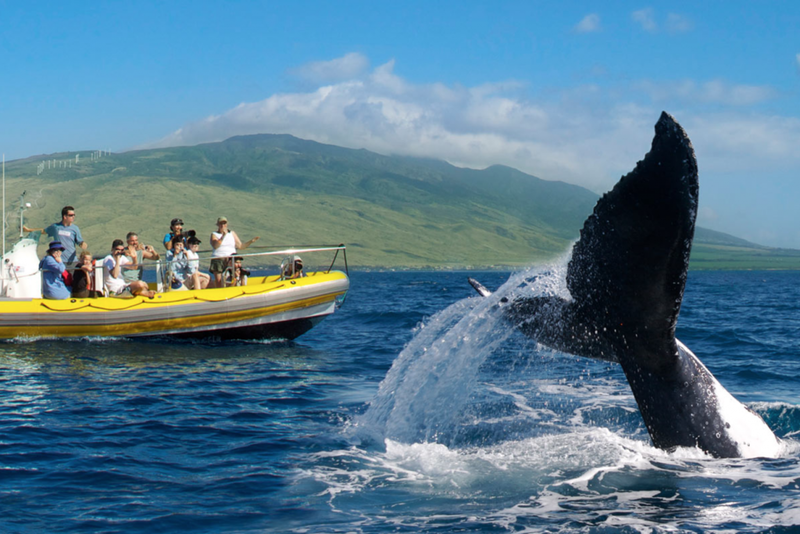 During whale season, kids will be entranced by the marvelous size and beauty of Maui humpback whales. Children ages seven and up are recommended for whale watching and may vary depending on the whale watching company you choose. Almost all Maui whale watching tours also offer complementary hydrophones with your tour so guests may listen to the wonderful songs of the humpback whales. A Maui zipline tour will surely become one of the highlights of your Maui vacation. Soar over lush Maui landscapes and majestic ocean views on a Maui zipline adventure. 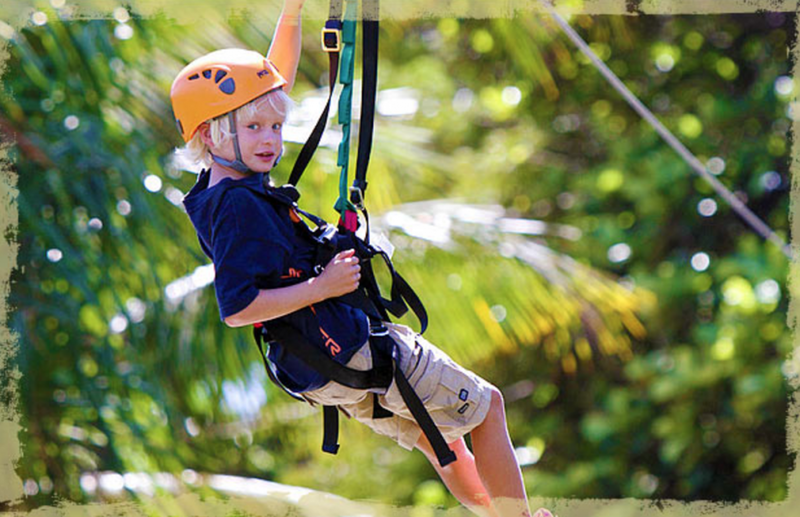 Maui ziplines are all family friendly and some even welcome children as young as five years old. Zip past swaying palm trees and waterfalls side by side next to your kid or zip with them! A Maui zipline tour will surely become one of the highlights of your Maui vacation. For family members who don’t want to zip, they can always enjoy the scenic grounds of any Maui zipline location. Some Maui helicopter companies fly children under two years old for free. Experience Maui’s most remote locations and discover hidden breathtaking views with your kids. 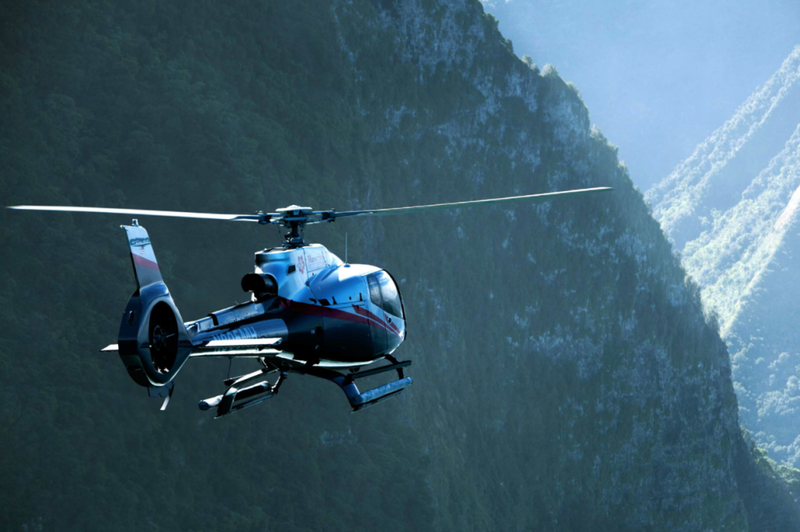 Maui helicopter tours will surely excite the children when they hover next to cascading waterfalls and towering sea cliffs. Some Maui helicopter companies even fly children under two years old for free. Make sure to bring your camera so that you can capture extraordinary family pictures that you and your family will treasure for a lifetime. Make sure to rent a surfboard or take some surfing lessons from Maui’s myriad of family owned and operated businesses. Surfing is a fun activity and an incredible skill to learn for kids and adults alike. Home to over 30 miles of swimmable beaches, it is no question why most Maui locals are skilled surfers and are basically ocean dwellers. So when visiting Maui, make sure to rent a surfboard or take some surfing lessons from Maui’s myriad of family owned and operated businesses. 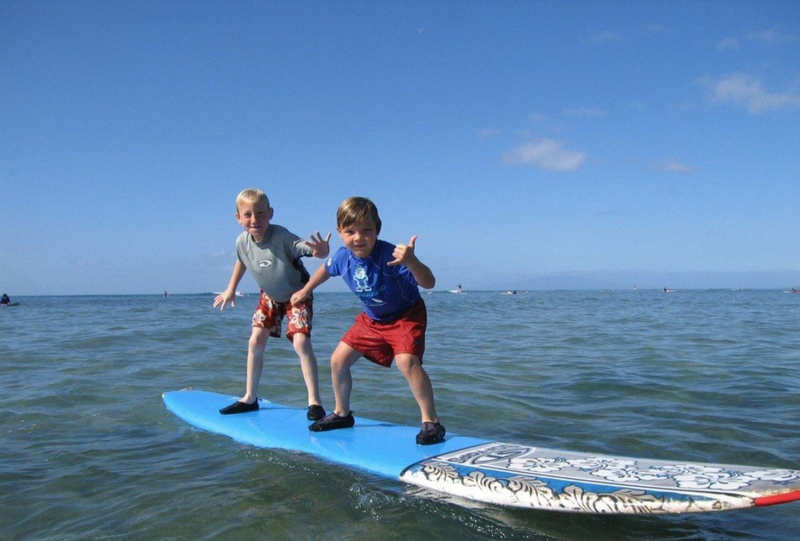 The kids will surely appreciate the lesson during your memorable Maui vacation. Kids and adults alike are going to appreciate the magical beauty and splendor of a Maui sunrise above cotton shaped clouds and Martian landscapes. 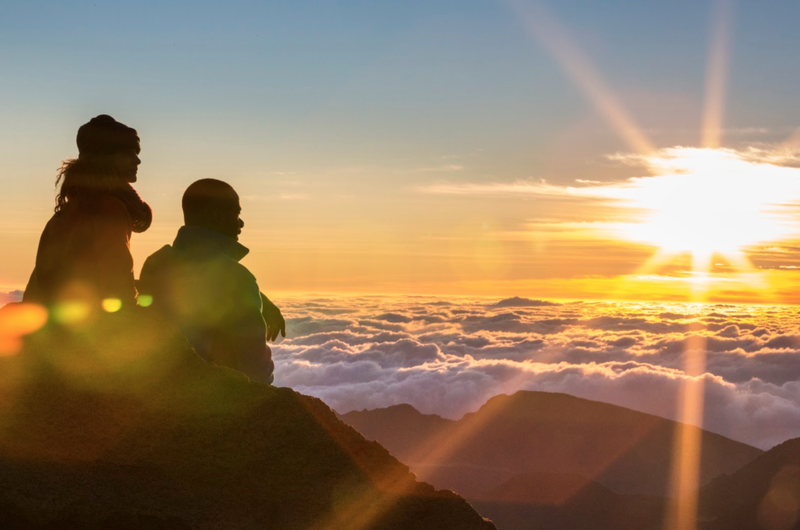 A visit to Maui is not truly complete without observing the sunrise from the top of Maui’s tallest mountain peak, Haleakala. Kids and adults alike are going to appreciate the magical beauty and splendor of a Maui sunrise above cotton shaped clouds and Martian landscapes. The myriad of spectacular colors slowly painting the morning sky of Haleakala cannot be replicated anywhere else and has to be one of the most picturesque sunrises in the world, if not the most picturesque. Just make sure the kids are wearing warm layers as the temperature at Haleakala’s summit can be a bit chilly. Maui submarines are mostly climate-controlled with large viewing ports for a pleasant and exciting underwater tour. Explore Maui’s underwater world with the whole family on a Maui submarine tour. Maui’s spectacular underwater paradise is teeming with acres of marvelous coral gardens and diverse marine life. Maui submarines are mostly climate-controlled with large viewing ports for a pleasant and exciting underwater tour. During Maui’s whale season, whales even swim into view next to your submarine. How wonderful it would it be for every child to experience diving 100 feet under the ocean without getting wet! The Maui Ocean Center is nationally named as one of the best aquariums in the US and touts its replica of the natural Hawaiian ocean ecosystem. Kids will enjoy exploring and getting up-close with Hawaii’s underwater world at the Maui Ocean Center. The Maui aquarium showcases a variety of Hawaiian sea life, from its immense collection of live corals to a variety of sharks, turtles, and tropical fish. The Maui Ocean Center is nationally named as one of the best aquariums in the US and touts its replica of the natural Hawaiian ocean ecosystem. 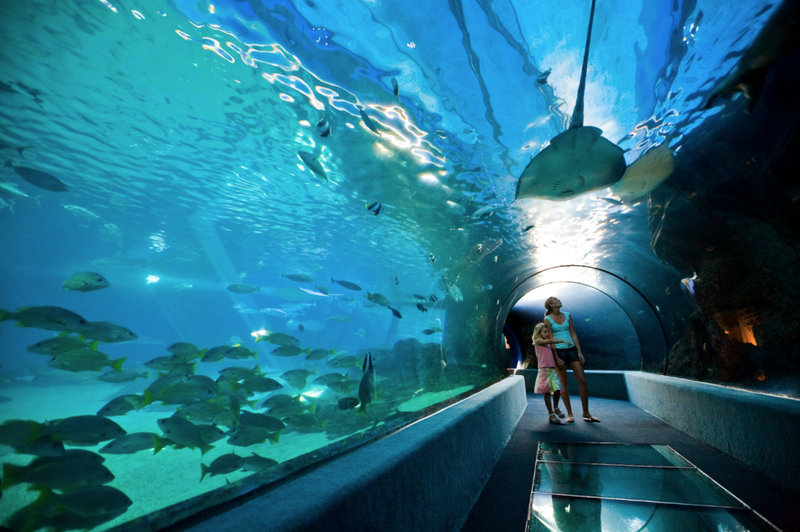 The Maui Ocean Center also has a 240-degree tunnel for a virtually real underwater experience! The Maui aquarium is open daily from 9:00 AM to 5:00 PM. No matter what activity you choose to do, the beach is always a great idea. Last but not the least, an activity that the kids will enjoy can be something as simple as taking them to the beach to relax and have fun in the water. 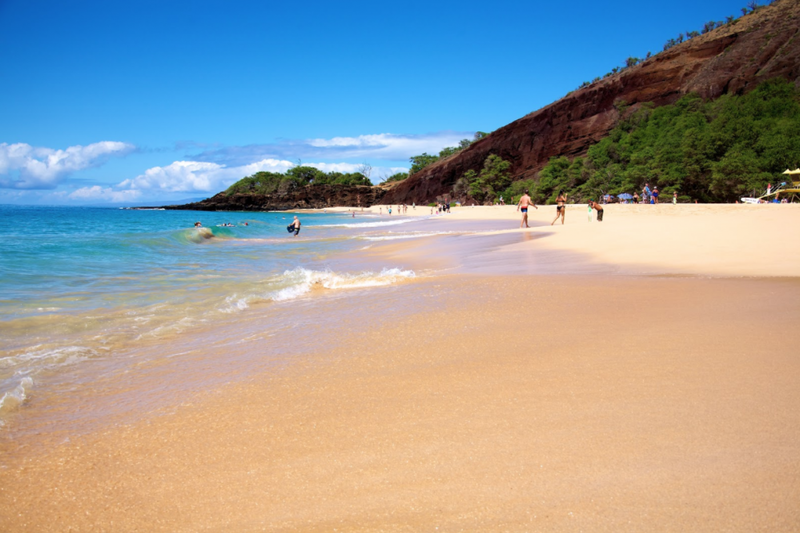 Younger kids are going to love the gentle waves of Maui’s calmest beaches like Kapalua and Napili beach. Beach time is also perfect for older children for surfing, snorkeling, or paddle boarding. Imagine your kids gleefully skipping and splashing in the water, having fun under the sun. No matter what activity you choose to do, the beach is always a great idea.